Chandigarh: Rice growers in Punjab, India’s grainbowl state, couldn’t have had it worse. Two days after the sowing season began, they are grappling with a shortage of farm hands to plant the crop, surging costs and fertilizer scarcity that’s threatening production of the food staple. A decline in Punjab’s rice crop, which includes the flavourful basmati variety, would hurt the entire nation, already battling soaring food prices that have pushed up the inflation rate to a near four-year high. Punjab is the largest contributor to the Central rice pool—the stock purchased by government agencies for distribution nationwide. “It is not just a state issue, but one of national food security," agriculture expert Pritam Singh Kumedan said. Most Punjab farmers were unable to plant rice on the first day of the sowing season—Tuesday—because of a shortage of farm workers, who usually come from the states of Uttar Pradesh and Bihar. Farmers managed to plant the crop in just 27,000ha on Tuesday, less than one-third of the state’s target of covering 100,000ha. The rice planting season lasts some 25 days, and around 100,000ha are covered every day. The sowing of basmati begins a fortnight later. The area of basmati plantation is expected to be around 250,000ha this year, up from 225,000ha last year. The shortage of farm labour this year is so serious that Kumedan suggests the Punjab government pay for the cost of transporting workers from Bihar for the duration of the sowing season. A crisis can be averted if the government offers farm hands free travel in the next three weeks, he said in a proposal to the state administration on Wednesday. More job opportunities in industrial belts in northern India and the National Rural Employment Guarantee Scheme, which offers 100 days of employment a year to one member of poor rural families, is responsible for the decline in the arrivals of farm hands from Uttar Pradesh and Bihar, said Punjab government officials, who declined to be named. Around a million extra hands are required during the kharif, or summer, crop sowing, and the state is almost totally dependent on manual labour, the officials said. 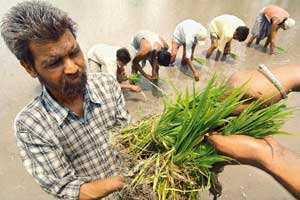 Punjab’s agriculture minister Sucha Singh Langah said rice production targets would be met despite the problems. “The state is gearing up and there is no question that the target will not be fulfilled," he said. The labour shortage highlights Punjab’s failure to modernize farming. Mechanized transplanters used for sowing, which cost Rs10 lakh each, are too expensive, state officials said. The Punjab State Farmers Commission bought four such machines. A machine costs Rs1,000 to rent for a day and plants rice in 2.5ha. Mechanization is key to overcoming the shortage of farm workers, experts say. “Already Punjab is using harvestors, and it should now move towards mechanization of transplanting as well," said G.S. Kalkat, chairman of the Punjab State Farmers Commission and a former vice-chancellor of the Punjab Agricultural University in Ludhiana. Punjab farmers are already struggling with higher diesel prices. For every ha of rice sown, the diesel required for use in tractors, harvestors and generators is around 100 litres. A Rs3 hike in the per litre diesel cost pushes up a farmer’s per ha cost to Rs300.